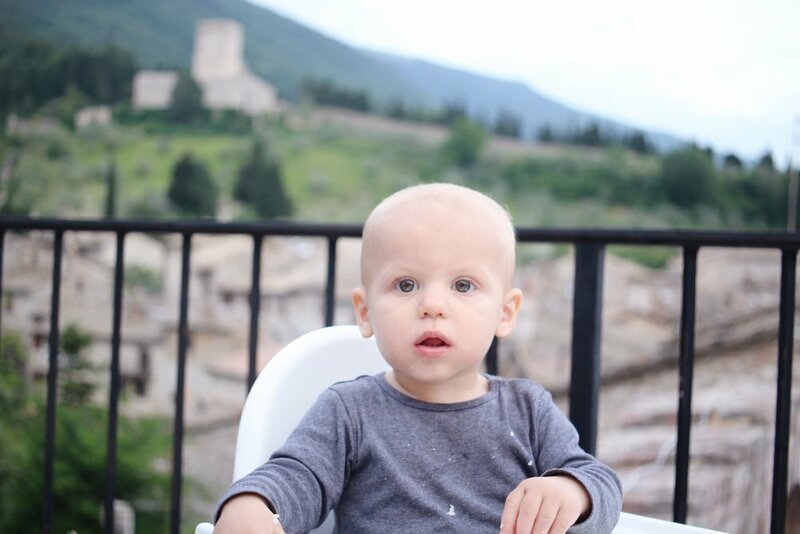 Our little family recently returned from Italy where Jeff took an intensive Italian language course for two weeks in Assisi. 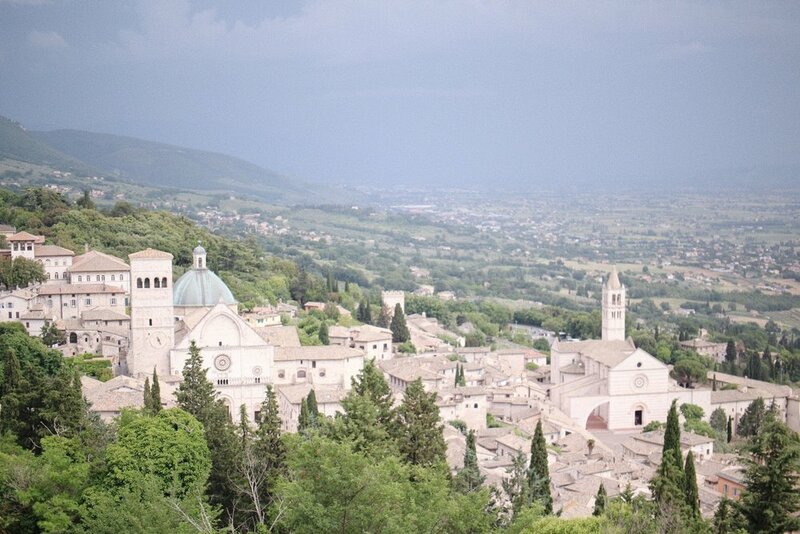 I had been to Assisi before, but only for a day, so it was a dream to spend two weeks in this beautiful town. I’ve had many people reaching out to me asking about things to do and see while in Assisi, and I'd like to share a few tips. 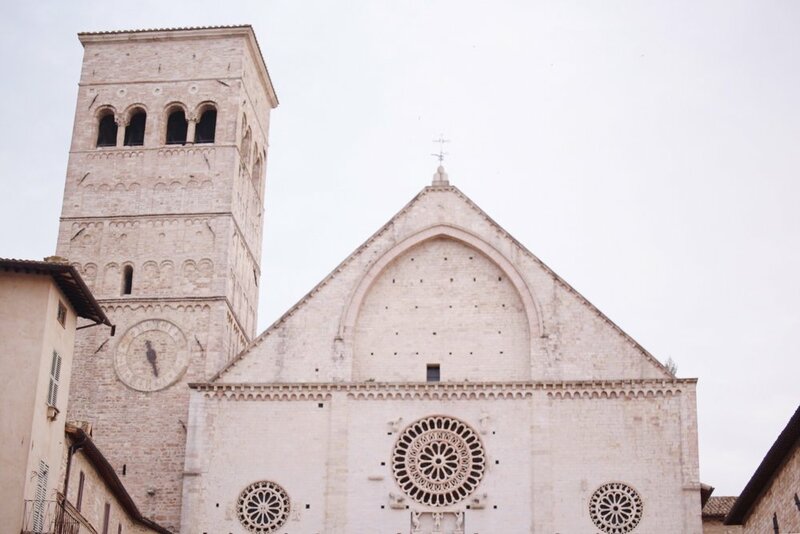 If you’re planning on visiting Assisi, this post is for you! This is where we stayed, and we LOVED Francesco (of course that's his name! ), the apartment owner. He was so friendly, always there to help in a dash, and generous. We even hung out with him a few times during our stay because we enjoyed his company so much! I really think that staying near San Rufino (as we did) is the perfect location because it's near the main plaza and where most things are (besides the Basilica of San Francesco). But all I gotta say is find a place with a patio and a view, and your experience will be spectacular. In San Rufino you can see the font where St. Clare and St. Francis were baptized, and where the babies within the city are still baptized today. There is an amazing little permanent art exhibit with paintings of Pope Saint John Paul II where you can purchase prints of one of the paintings in the church. The museum below the church contains archaeological remains, religious artifacts and many paintings. You can also see the 11th century crypt of St. Rufino, the patron of Assisi. And if you befriend the nuns there, they may show you their little farm of ducks and chickens! Santa Chiara is where the body of St. Clare rests, and where the cross that spoke to St. Francis telling him to rebuild Jesus' church is displayed. We loved going to Mass in the side chapel in the mornings and listening to the beautiful singing voices of the Poor Clare sisters. There also is an amazing side chapel (to the left when you walk into the basilica) that is reserved for prayer and you won't be bothered by noisy tourists! We would walk here nearly everyday to experience the massive beauty of this church. There is an upper and lower basilica rich in history and breathtakingly beautiful art. Below the lower basilica rests the body of St. Francis. The convent in which St. Clare lived and died with her sisters. This is also the place where St. Francis received his calling from Jesus to "rebuild his Church" (the cross was later moved to St. Clare's). 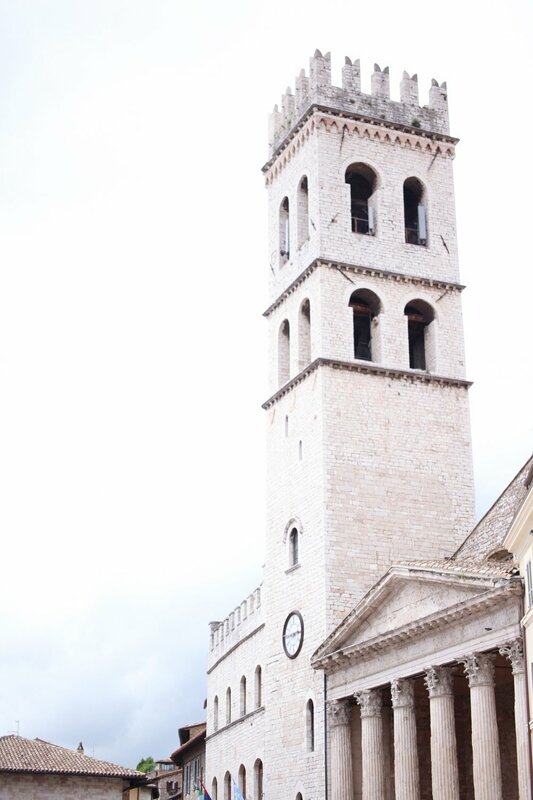 There isn't a ton to see here in comparison with the other churches in Assisi listed above, but it is an important part of the story of St. Clare and St. Francis, and a very beautiful, peaceful place. 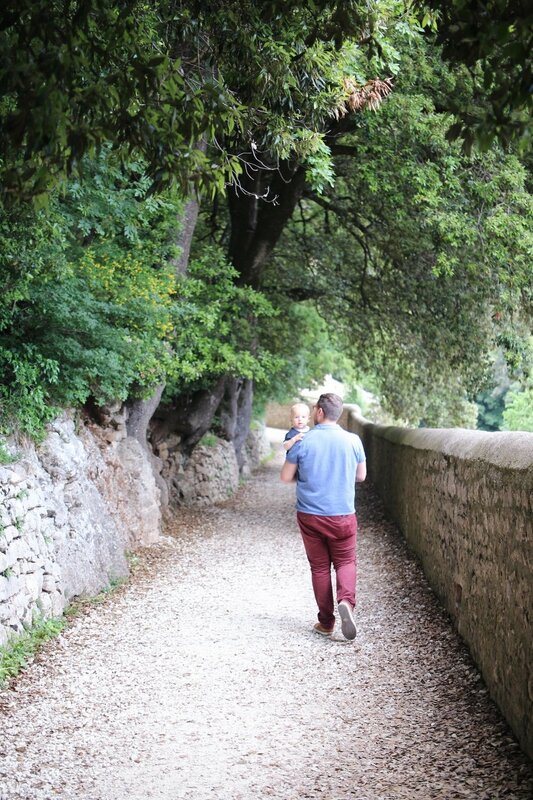 If you decide to walk here, be prepared for a steep journey back up the hill to the town of Assisi. It's a beautiful walk, but I definitely wasn't wearing the right clothes and shoes for the occasion. 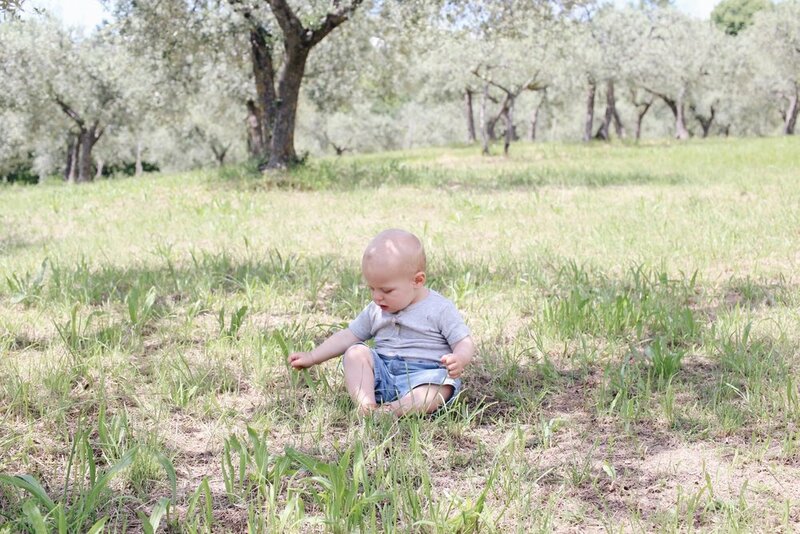 Thankfully I could stop on my way up with Isaiah and rest underneath the shade of olive trees in the olive grove. 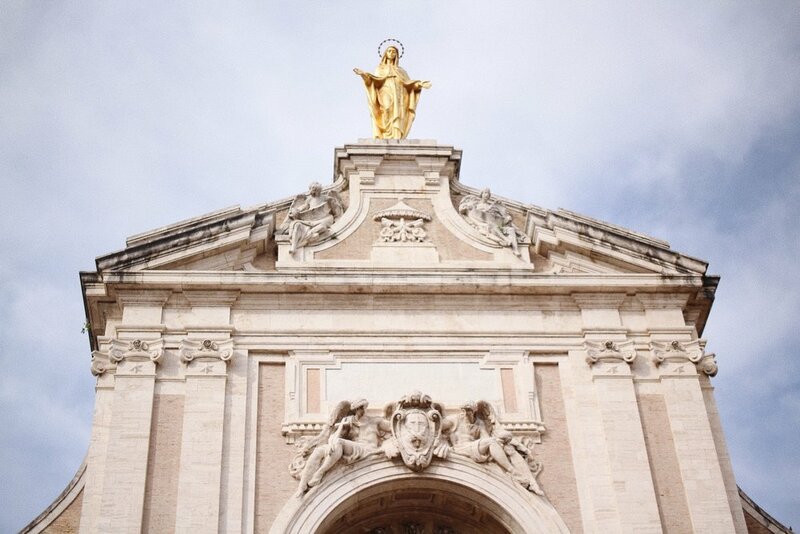 If you are staying within the city walls of Assisi, take a bus to Santa Maria Degli Angeli, the Papal Basilica of St. Mary of the Angels. Here you will find the small church that St. Francis rebuilt surrounded by a massive basilica. There is a side chapel where St. Francis died, and through the museum you can see the rose garden where St. Francis threw himself into a hedge of thorns to overcome doubts and temptations. According to tradition, attested to by the end of the 13th century, the hedge then miraculously changed into thornless roses, giving origin to Rosa Canina Assisiensis, which continue to flourish today in the little garden. Ermo Delle Carceri is the hermitage of St. Francis located in a steep forest about 2.5 miles above Assisi. In the 13th century St. Francis would come to this place to pray as other hermits before him did. If you're in a hiking mood, make a pilgrimage to the hermitage and hike up past the grounds to experience astounding beauty in nature. Or you can take a taxi to the top and walk down. The views walking down are incredible and you'll come across a few restaurants (more on that below). The Museum of the Roman Forum is a must see in Assisi. Start with the Temple of Minerva (now a Catholic church), and continue downhill on the plaza to the entrance into the museum uncovering fascinating evidence of the city's Roman past. Dating back to the 12th century, this grand castle fortress overlooks the city of Assisi. The hike up is short and the views at the top are breathtaking. There isn't much to see in the castle itself, but it is amazing to think about the history that has happened within the castle walls. ***My husband and I would recommend downloading Rick Steve's Audio Europe Free App to follow along with many of these sights. While Rick isn't perfect in his explanation when it comes to the spiritual side of things, we still really enjoyed his guides! My main tip when dining in Italy is to ask what the house specialty is and that will always be an amazing dish. Most often in this area it is going to be a pasta dish with truffles. If you're a mushroom fan, you'll go crazy over this restaurant's truffle pasta. Here you'll find the best Naples style pizza. You don't need to stay at this hotel to enjoy the inexpensive and delicious restaurant that provides a dinner with an incredible patio view of a castle. You can grab drinks on the lower patio, but the upper patio is where the food and view is. On your hike down from Eremo delle Carceri stop at La Stalla for a completely local dining experience. Absolutely amazing food. Reserve a picnic at Saio Wine Shop and prepare yourself for an evening in Heaven. The experience starts at the wine shop where you get to taste a few wines and pick which one you'd like a glass of. Then they they hand you a map to walk your way through the vineyard to the veranda surrounded by jasmine for your picnic. If you have children, be sure to ask about their friendly pet goats and chickens and make a stop on the way! If you're wanting to switch things up, here you'll find a modern take on Italian food. I ordered a shrimp mojito pasta unsure of what I would get. It was like iron chef and the secret ingredient was mojito. You wouldn't imagine mint working well in pasta, but it was actually spectacular. Be sure to make a reservation early in the day or a couple days prior as it's always busy. If you'd like a quick meal, grab a delicious warm piadina from Piadina Biologica (just down the hill of the main plaza). Take it and sit on some stairs in the main plaza to people and pigeon watch. 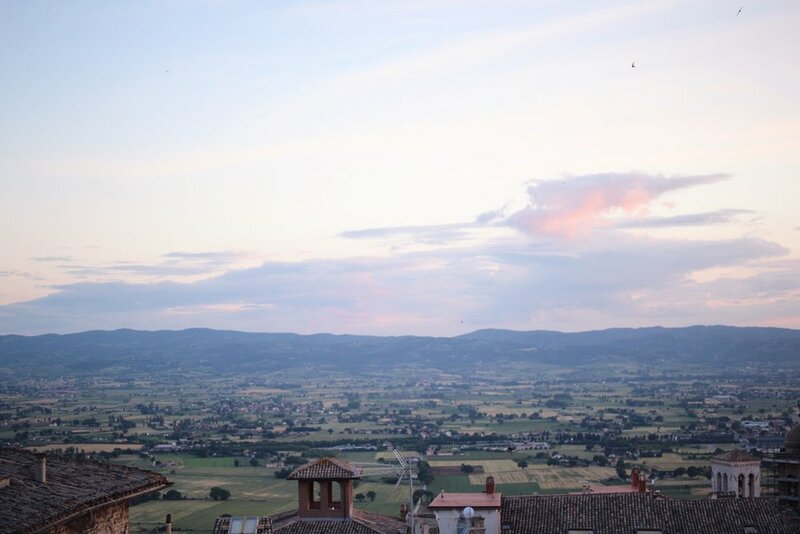 Staying a little longer in Assisi? Just outside of city walls you'll find a supermarket with good prices and lots of variety. This is an adorable cafe that opens early and has a beautiful patio view. The two charming ladies that work there are a true delight. It's right next to the elementary school so you'll get to see busy parents walk in with their children (backpacks in tow). It's fun to see local families! This cafe is owned by our Airbnb apartment owner, Francesco, and his family. Located over by the Basilica of San Francesco, just stop in and let Francesco make your day. 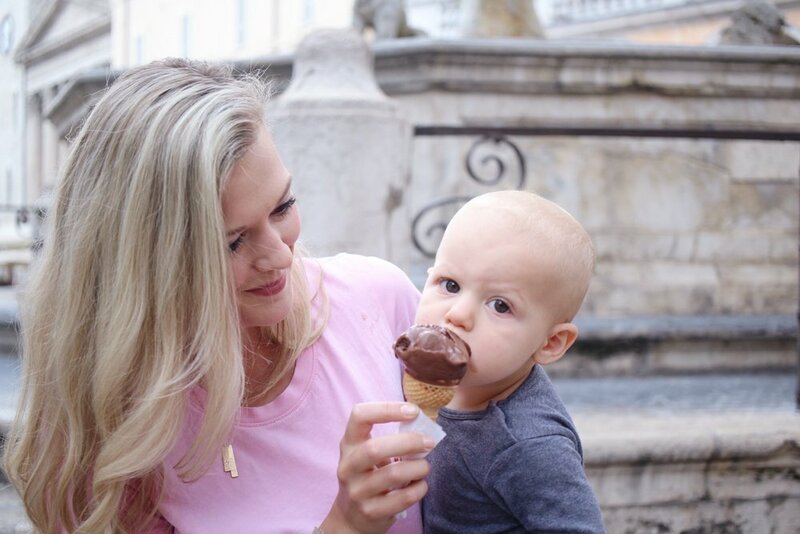 Francesco takes pride in the barista science and carefully selects the gelato they serve. Truly amazing! 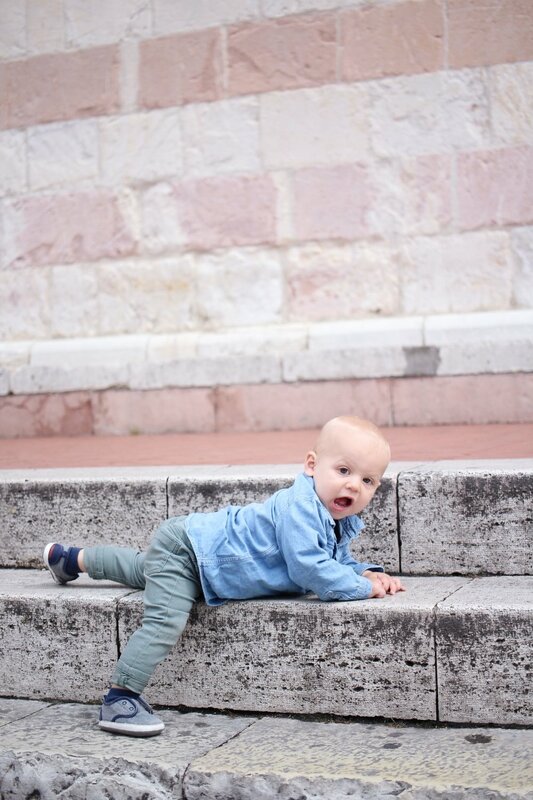 There is much to be marveled at in Assisi, and I hope you love it as much as we do!